The future looks sunny, with Apple being granted a patent for a dual-sided laptop display that can be powered by solar panels housed within the back of the lid. 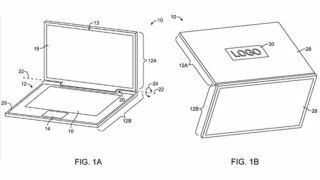 According to Hot Hardware, the "electronic device display module" patent, which was granted by the US Patent and Trademark Office along with another 30 patents, describes a laptop that houses an LED or Retina display in the front of the lid as you would find on any MacBook. The back of the lid on the other hand will be made up of photovoltaic cells, otherwise known as solar panels. These panels will sit under electrochromic glass, or smart glass, which controls how much light goes through. Different layers of the rear-facing smart glass can house its own elements, such as a logo or other information, which can be lit up using power from the solar panels. Of course, solar power could be used to recharge the laptop's battery, but it could also be used to power touch sensors that the patent says may be located on the rear part of the laptop display as well. "A control unit may be used to process touch commands on the rear plate to perform functions such as unlocking a magnetic latch that holds the upper housing to the lower housing," the patent reads. But as with all patents, these innovations may never come to be - though it should be noted that this isn't the first time that Apple has patented solar powered designs for its devices.